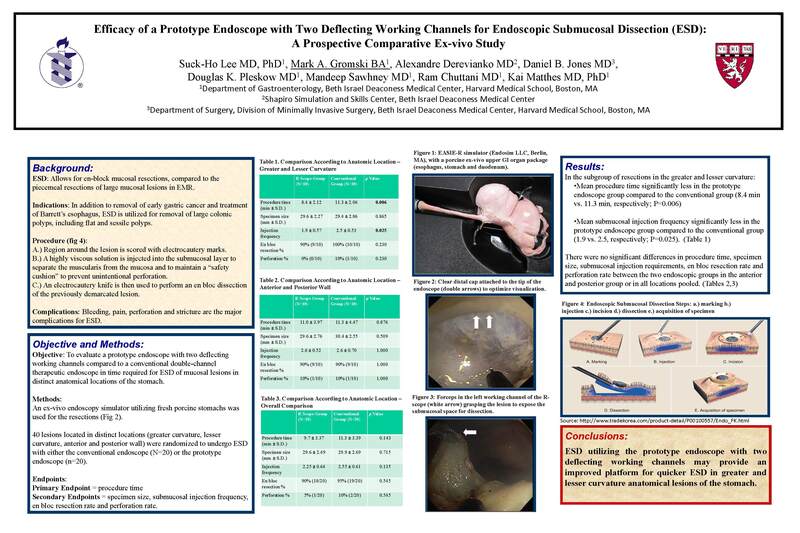 Introduction: The aim of this study is to evaluate a prototype endoscope with two deflecting working channels (the R-scope, Olympus Japan, Inc) compared to a conventional double-channel endoscope in time required for ESD of submucosal lesions in distinct anatomical locations of the stomach. It is our hypothesis that ESD of submucosal lesions with the R-scope will take less time than with the conventional endoscope. Methods and Procedures: This study is a prospective, comparative ex-vivo study. An ex-vivo endoscopy simulator utilizing fresh porcine stomachs was used for the resections. Forty lesions located in various locations (greater curvature, lesser curvature, anterior and posterior wall) were randomized to undergo ESD with either the conventional endoscope (n = 20) or using the R-scope (n = 20). The sample size was determined by assuming that a novel device (R-scope) would decrease the procedure time by 30%. Given an α = 0.05 and a power of 80%, a sample size of 18 lesions was required for each endoscope group (R-scope vs conventional). Data were analyzed using statistical software (SPSS version 13.0; SPSS Inc, Chicago, Ill). Categorical variables were compared by using the X2 test and continuous variables were compared using the Student’s t-test. We considered a p value < 0.05 to be statistically significant. Results: In the subgroup of resections in the greater and lesser curvature, the mean procedure time was significantly less in the R-scope group compared to the conventional group (8.4 ± 2.1 min vs 11.3 ± 2.1 min, respectively; P = 0.006) and the mean submucosal injection frequency was significantly less in the R-scope group compared to the conventional group (1.9 ± 0.6 vs 2.5 ± 0.5, respectively; P = 0.025). There were no significant differences in procedure time, specimen size, submucosal injection requirements, en bloc resection rate and perforation rate between the two endoscopic groups of all combined anatomic lesions. Conclusions: Our study confirms that ESD of submucosal lesions with the R-scope does take less time than with a conventional double-channel endoscope, in certain anatomical locations. ESD utilizing the R-scope may provide an improved platform for quicker ESD with equivalent safety, especially in greater and lesser curvature anatomical lesions of the stomach.